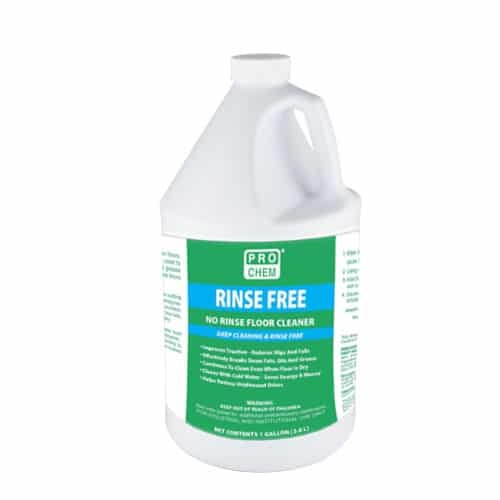 RINSE FREE | Pro Chem, Inc.
RINSE FREE is a neutral pH floor cleaner that combines grease cutting surfactants and non-pathogenic enzyme producing bacteria that breaks down and digests fats, oils and grease that other alkaline-based products leave behind. It continues cleaning the surface even after the floor is dry; lessening the chance of slips and falls while reducing odors. Cold water can be used with this product to clean, saving money and energy. Contains fast-acting enzyme fortifications that allow it to clean faster and deeper. *Not for use on food contact areas. Store in accordance with local regulations. Store in original container protected from direct sunlight in a dry, cool and well-ventilated area, away from incompatible materials and food or drink. Separate from acids. Wipe up spills and sweep up loose debris from the floor, then dilute 2 oz. of RINSE FREE floor cleaner per gallon of cold water. Using a clean mop, apply solution liberally to the floor. Wait 5-10 minutes to allow sufficient contact time, then scrub with a deck brush. Squeegee excess to floor drain and allow to air dry. DO NOT RINSE. Avoid contact with disinfectants, boiling water or chlorine products. Note: Do not use on food contact areas.